» Which NFL Teams Got Better This Offseason? why don’t we do that today? No, now is not the time to start filming our I Love the ’10s pitches about dubstep kings. Since the league’s 32 teams are done with the vast majority of their player acquisitions for the upcoming season, though, we can start putting all those signings and trades and drafts into context by taking a look at which teams actually made a serious investment into filling the biggest holes on their roster. Of course, we also need to question those teams who failed to fill their noticeable problem, whether they entered the offseason with that issue or created it with their offseason moves without addressing it by the end of the NFL draft this past weekend. We’ll start with the teams who did a great job of patching things up on Tuesday, then finish with the teams who failed to make the grade on Wednesday. Please note, though, that this is an analysis that strictly considers investment at a given position as opposed to one that weighs the way that a team considered multiple problems or the likelihood of a fix actually solving said problem. Take the Browns, for example, who had a concern about upgrading at quarterback before this season. We’re not particularly fond of Brandon Weeden, but the Browns invested a first-round pick to try and fix their hole at quarterback. Even if it fails, it’s still a serious attempt to solve the quandary. That intent is what we’re talking about over these next two days. OK, with Tom Brady. To fix the rush, they went out and signed one of the best pass rushers to ever hit free agency as he’s about to enter his peak. This football stuff sure is easy! Of course, it’s worth noting that Mario Williams will have a greater impact than his sack total. His presence should free up space for the dominant pair of defensive tackles alongside him, which could cause Marcell Dareus — who led the team with 5.5 sacks in 2011 — to hit double digits in 2012. And remember what the presence of an elite pass rusher and two great defensive tackles did in Minnesota for Ray Edwards? That could create another opportunity for whoever lines up at defensive end across from Williams; perhaps Shawne Merriman? 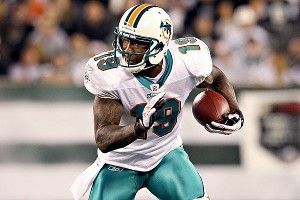 When the Bears acquired Brandon Marshall in the opening hours of free agency from the Dolphins, it seemed like the precursor to bigger things for Miami. Instead, it just ended up serving as a brilliant buy-low opportunity for Chicago. The years of messing around with the likes of Devin Hester and Johnny Knox as possible no. 1 targets for Jay Cutler are finally over, and all it cost the Bears was a pair of third-round picks. With no dead money on their cap if they choose to release Marshall, the Bears were able to take a calculated risk with huge upside for their offense. Now, Hester can move into his proper role as a home run threat, Earl Bennett can become the full-time slot receiver, and Knox can heal up from last year’s scary back injury without anyone wondering whether they need to pick up Dane Sanzenbacher in fantasy football. Peace in our time. OK, OK, now you’re really angry. Yes, on Friday, we absolutely lambasted the Browns for taking Trent Richardson with the third overall pick of the NFL draft. They had holes elsewhere, running back’s an easy position to find cost-effective talent at, and Richardson may not be able to do very much if the non–Joe Thomas parts of Cleveland’s offensive line don’t improve in 2012. That’s all true. In a vacuum, though, we agree with what our colleague Chris Brown wrote on Monday: Trent Richardson is a hell of a football player. And while the Browns could have upgraded with a veteran running back or by selecting somebody in the later rounds, replacing a disinterested Peyton Hillis and a middling Montario Hardesty with Richardson is just about the biggest player-for-player upgrade a team made at any position all offseason. (Yes, Andrew Luck–for–Curtis Painter is a bigger upgrade, but we’re talking about teams that went out of their way to acquire new talent, not ones who had the best prospect in years fall into their laps because they were terrible all season. The Browns, remember, traded up to get Richardson.) It’s not the most efficient way to use your team’s resources, but the Browns got an enormous talent-for-talent upgrade here. Perhaps you were one of the many Cowboys fans, bettors, and otherwise backers who spent most of the year cursing at Mike Jenkins to get up and Terence Newman to get bent. If so, you’re apparently reading this from your perch in the mid-’70s, but you get the idea. The Cowboys went the whitewash method at cornerback to compete with the scary group of receivers that the Eagles and Giants will throw at them for four games each year, as they replaced Jenkins and Newman with $50.1 million man Brandon Carr and then traded up to draft LSU cornerback Morris Claiborne in the first round on Thursday. Both Newman and Jenkins had Pro Bowl pedigrees, so it’s not like the Cowboys are replacing a couple of no-name scrubs, but their new starters at corner should be a healthier, more productive bunch. They’re still stuck with Gerald Sensabaugh at safety, but that’s another conversation for another day. Yeah, replacing Tim Tebow with Peyton Manning was probably a pretty big upgrade, too, but let’s focus on some of the other work that Denver did this offseason. While Daniel Fells and Dante Rosario exhibited the bizarre ability to suddenly turn into Shannon Sharpe in his prime during the final drives of Tebow-led comebacks, they were limited as receivers and would never have flourished in a Manning-led passing attack. While they were linked to Dallas Clark as part of the great Indianapolis Immigration Act of 2012, the Broncos were smart enough to pass on the aging, injury-prone Clark and instead opt for Jacob Tamme. While Tamme is another ex-Colt, he’s one of the few members of the Manning offense who isn’t past his prime and might actually flourish in his new digs. Denver also made a nice investment by adding Joel Dreessen, who’s consistently been an effective, efficient player behind Owen Daniels in Houston. Even if the Broncos hadn’t added Manning, signing Tamme and Dreessen would have been a wise move; by doing so, the Broncos now have one of the five best one-two punches at tight end in football. Justin Blackmon might very well have more catches over the remainder of his career than those seven players combined. If the Jaguars get anything out of Laurent Robinson, it’s gravy. Did you know that there are 57 broken tackle animations in Madden and the Eagles successfully exhibited 54 of them within two yards of the line of scrimmage last season? That might be a totally made-up stat, but Philadelphia sure did miss a lot of opportunities to make plays on running backs in the backfield last season. And after years of trying to get by with late-round draft picks and castoffs at linebacker, the Eagles finally made their first significant investment at the position in years by acquiring two-time Pro Bowler DeMeco Ryans from the Texans for a fourth-round pick and a swap of third-rounders. Ryans struggled in 2011, and there are two explanations for his problems: Ryans either wasn’t 100 percent after tearing his Achilles or struggled to adapt to Wade Phillips’s 3-4 alignment after spending his career in the 4-3. The Eagles hope it’s the latter, but would settle for both, as even 85 percent of the player Ryans used to be would represent an upgrade in the middle for Philly. At which positions were the Seahawks below average in 2011? The only clear answer to that question is quarterback, and while that’s the toughest position to fill without overpaying for a middling player or using a high draft pick on a player, the Seahawks made two moves to upgrade on the dismal combination of Tarvaris Jackson and Charlie Whitehurst. First, they went out and acquired Matt Flynn while guaranteeing the former Packers backup only $10 million, chump change for a two-year look at a possible franchise quarterback. They also spent a mid-round pick on Wisconsin starter Russell Wilson, speculating against one of the league’s widest-held biases, the tall quarterback. Wilson’s 10 times the player Broncos second-rounder Brock Osweiler is, but because Osweiler is annoying to sit behind at the movies, Osweiler was chosen first of the two. Of course, there’s no guarantees that either of the two will turn into the long-term successor to Matt Hasselbeck, but Flynn and Wilson have the upside to at least inspire hope of a Seahawks team that won’t have to prop up its quarterback to win football games. Too often last year, the Buccaneers’ offense broke down into Josh Freeman trying to improvise something on third-and-long because nobody was open. Tampa fell in love with their young talent before 2011, and none of their young players saw their stock fall any further than halfback LeGarrette Blount and wide receiver Mike Williams. After promising rookie seasons, Blount and Williams each produced disappointing, mistake-riddled sophomore campaigns. The pair still have time to improve, but it would have been foolhardy for the Bucs to depend on them to each be no. 1 players at their position for the team. That’s no longer a problem. Williams will shift into a complementary role after the acquisition of Vincent Jackson in free agency, while Blount will split time with 31st overall pick Doug Martin at running back. Martin’s skills as a receiver out of the backfield should serve as the ideal combination with Blount, who caught just 15 passes last season. The Redskins were somewhat akin to the poor man’s Seahawks last season. The Seahawks would have been a very good football team with even an average quarterback, while the 5-11 Redskins probably could have approached .500 if they had gotten adequate play from their options under center. The Redskins had a decent defense whose play was masked by terrible average starting field position, with a pair of effective pass rushers in Brian Orakpo and Ryan Kerrigan. And as much as the Shanaclan did to mess with the confidence of the team’s running backs, the Redskins showed flashes of brilliance on the ground. Their big problem, of course, was having Rex Grossman and John Beck under center. That would make anybody mortgage their future to pin their hopes on Robert Griffin III. The expectations for rookie quarterbacks are higher in 2012 after the unexpected success of Cam Newton and Andy Dalton as rookie last season, but RG3 doesn’t need to play up to their levels to serve as an effective replacement for Grossbeck. Even league-average would work nicely.